FINALLY got on my bike on Friday. My heavy(ish) commuter bike and spun around the block 3 miles. UGH. I could really feel it yesterday. But that’s a little unfair. I also went for a hike the day before (“low trail,” easy) and I did about a million loads of laundry and cleaned and washed dishes and did grocery shopping like mad and washed my kitchen floor (which probably hadn’t been done since the last Ice Age) ON MY HANDS AND KNEES (like a good German daughter). It took about 3 passes all over the floor (not really thorough in spite of it) and I think that was the real culprit to the extreme bright muscular pain all along my R ribcage, front and sides and back. 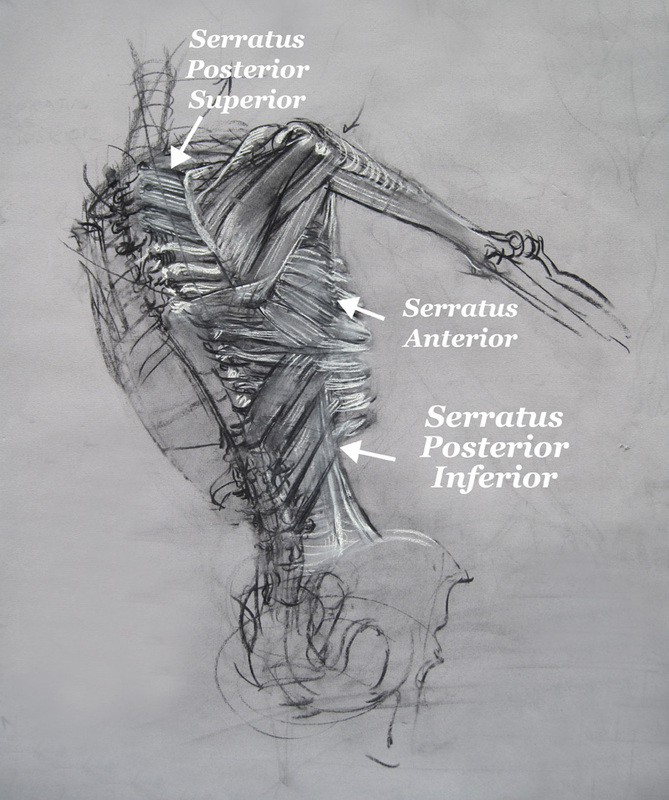 That’s all of the serratus—anterior, posterior, superior, inferior; intercostals; pecs (maj and min) and some of the SITTS group and especially the latissumus dorsi. UGH again. This is a beautiful drawing, the likes of which are rarely seen. Why do I think so? Because one doesn’t usually get an attempt at dimensionality like this, with the body out of the standard anatomical planes (see below). As if we, too, are without dimension and as if function and form aren’t intricately married. I love the cutaway so you can see the muscles and bones together. So beautiful. I can’t tell you how many posts I’ve been starting and abandoning lately. My mind is full of gunk. Because I’m not doing yoga. For I don’t know how many weeks. And because I haven’t been doing anything even mildly cardio (until yesterday). And because I have 2 teenage daughters and both are back in high school and that means I am tied to their schedules (not to mention their attitudes). We did have our last beach day of summer last Monday. Crane Beach. It was SO BEAUTIFUL. The water was cold (supposedly 65 degrees, but I’m thinking two degrees or more chillier). Gorgeous day, no ER visit on the way home, Gott sei Dank! I swam; I walked and walked and walked up the beach in one direction and down the beach in the other. I swam some more. I did a crawl stroke! I can’t tell you how exciting that is because, well I guess I just did. I even ran about 30 paces up the sand. Twice. But the pain is still intense sometimes. I still use my pink KT wrap tape. I still use ibuprofin around the clock. I still take salt baths. I still use ice packs. I still massage with any and all sorts of camphorous liniments from the Chinese grocery. Yesterday I did a quickie, 7-mile bike (ROAD BIKE, HALLELUJAH!). It hurt like hell last night, but today I feel stronger. Just a couple of hours ago, I lifted a kayak and an old wooden bed frame and hauled them down to the curb for quick sale. I’m tired from school starting and all of the emotions that go with it, but starting to think that soon I will be back to my old self and able to do yoga, maybe even this week. Maybe I can scrub out the tub too!!! It’s the small things, my pets. Is this my most boring post ever? It’s not very fun being self-absorbed. I have about 5 different kinds of liniments from the Chinese grocery on my nightstand and I love every one of them. The little glass jars. The camphor and mint smells. The picture of the old Chinese man and the picture of the tiger. 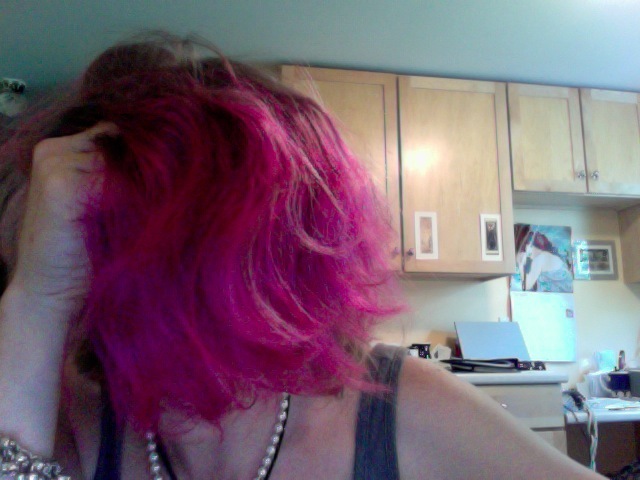 When I went to pick up my farm share yesterday morning, a friend looked at my fuscia hair and asked (I paraphrase) you are on a new wild streak? To which I said, oh, no, not new. It’s been going on for quite a while. Here’s to wild streaks. And here’s to Wong To Yick. My wife has also gone the fuscia route, one side only. She is known for some rather eccentric hair experiments. Her one side only fuscia is overlaid by her natural blond so the fuscia teases, randomly appearing and disappearing. Although, when a puff of wind blows that top layer back and her left ear is exposed, covered in a wave of fuscia, she is then referred to by her Indian name, Woman With One Earmuff. Sounds like my kinda gal. I do think this trend is starting to be a favorite not only with the teens and college kids, but moms, too–it’s like make-up only maybe funner. Not permanent like a tattoo.